Donna Campbell and Georgann Eubanks, owners and operators of Carrboro-based multimedia production company Minnow Media, have traveled wide in documenting lives and discovering truths – but North Carolina’s home. Campbell is from Iredell County. Eubanks came to Duke in 1975 from Atlanta and never left. They know the terrain and the people who traverse it. For example: Campbell and Eubanks produced three documentaries in the aftermath of Hurricane Floyd (Hard Rain, Higher Ground and Faces From the Flood), standing with families amid the obliteration of their homes and destruction of their communities, then witnessing, over the course of a decade, as they rebuilt their lives. Change, transformation, is at the heart of Minnow Media’s work. Such was the spirit behind the Floyd documentaries – stories, Eubanks says, “about losing everything and picking up and starting over … in the category of ‘never-be-the-same-again’” – and it’s the spirit defining their recent documentary Harvest of Dignity, which airs on UNC-TV tonight (Thursday) at 10. Their finding? Much has; much has not. 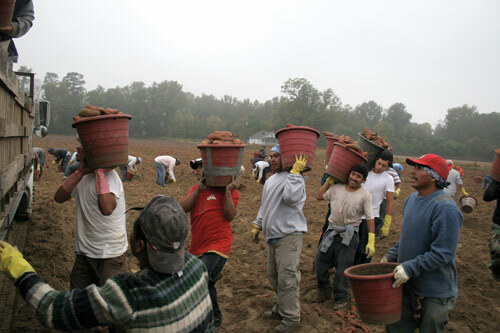 According to Steve Davis, an outreach worker in Greene County interviewed in Harvest of Dignity, 95 percent to 98 percent of the farmworkers in his county are Latino. When Harvest of Shame was made, most of those faces were black. The faces have changed, but the conditions are in many respects the same. 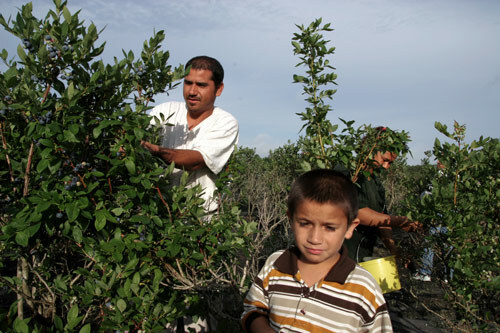 The Fair Labor Standards Act, for example, still allows children to begin working at a younger age and to work longer hours in agriculture than in other industries. “We have the same dreams and aspirations as everybody else,” Raul Gamez says in Harvest of Dignity. Gamez comes from a family of migrant laborers and now works with the children of farmworkers in collecting oral histories and producing plays around them. These kids comprise the fabric of the future of North Carolina. We have our preconceptions of what labor camps must look like – essentially, clusters of clapboard. Drive to the coast, Campbell says, and you won’t see many of those. Today’s “camp” is more likely a trailer park or a rambling old farmhouse, just within or out of view. Campbell and Eubanks urge you to have a look at the lives beyond. The Minnow Media team was formed 12 years ago. Campbell was in the media business with her sister, Susan, in Iredell County, and Eubanks, a writer and teacher of writing, was chair of the N.C. Humanities Council. “The short version of the story is that we got to know each other because Charles Kuralt died on July 4, 1997,” Eubanks says. The humanities council was preparing to honor Kuralt with its John Tyler Caldwell Award for lifetime achievement. When he died prior to the presentation, the council interviewed the Campbells about producing a video on his life, but the donor chose to go with a New York firm. Eubanks was impressed with the Campbells’ work though, and, having long held an interest in exploring video projects, she and Donna Campbell set up shop in Carrboro. Eubanks does most of the writing and Campbell is in charge of the visual aspect, but both play numerous roles. And both interact directly with their subjects. Minnow Media will continue to document how they have and haven’t. “I hope it doesn’t take another 50 years,” Hawkins says. Awesome article about 2 people. One I know from about 20 years ago. The other from roughly 1 year ago. Everyone craves synergy. Thanks for sharing Minnow Media.